If you are short of time, the answers to the following 3 questions should let you know all you need to about the Oral-B Pro 500. If we have missed something, let us know in the comments. If you want more detail, you can read our full Oral-B Pro 500 review further down the page or watch our video review. There is nothing ‘wrong’ with this brush, but to be honest, it is worth spending a few extra dollars to get a couple more value added features that are on offer from the Pro 1000. The Pro 500 does clean the teeth fairly well it also has a 2 minute timer built in which is good. Buy the Oral-B Pro 1000 that is our recommendation. It looks better, cleans better and has a couple of extra days battery life. If budget is an issue, the Fairywill FW-917 is an alternative option that provides excellent value for money. Slim, light, with a long battery life and 3 cleaning modes there is a lot to like considering it is often cheaper than the Pro 500. For a more detailed comparison of brushes, see our list of the top electric toothbrushes for 2019. 3. Where is the best place to buy the Oral-B Pro 500? Many stores stock the Pro 500, Walgreens, Jet, Target, Amazon, and many more. The online retailers tend to be the best priced, but be sure to shop around if this is the brush for you, because some are selling this above the recommended retail price. Typically we recommend Amazon as they are often amongst the best priced and prompt with their delivery. Below we’ve included a live price comparison for various US retailers – check which is cheapest or which you prefer buying from and go from there. The Pro 500 is a well-priced toothbrush which offers a good range features including a timer and 2D cleaning action, but there are better options available today that will help you achieve better oral health over time. What are the good and bad points about Oral-B’s Pro 500? Simple – A no nonsense toothbrush. Easy to use with 1 cleaning mode. Grip – The handle has rubber around it making it easy to grip, especially when slippery. Timer – A 2 minute timer is built in to encourage brushing for the right amount of time. Battery Status – No indication of how much power is in the brush apart from the slowing motor. Battery Life – Up to 5 days battery life, would be good if it was longer. The Pro 500 is designed with simplicity, practicality and budget in mind. It offers the core essentials without all the bells and whistles that most of us are attracted to. What this means is that the Pro 500 is a functional brush, but with such a focus on the basics comes a lack of what I would consider beneficial features. Opening the box, the contents is minimal. A brush handle, charging stand and a single Precision Clean brush head, oh and of course some documentation. The brush is relatively easy to hold it has a tapered design where it is thicker at the top of the handle and thinner towards the bottom. Oral-B’s more premium model tend to have a more uniform shape down the length of the handle, which I prefer. The body of the handle is made from a gloss White plastic, but the back of the toothbrush is mainly surrounded in a light Blue color rubber for grip, and there is a small darker Blue oval shaped section of the front which is where the power button is located. It’s nice and light with a maximum height of 22cm, is 3.2cm thick and weighs in 109g when the brush head is attached. The grip is very helpful, soft to the touch and stops the brush from moving, particularly when wet. On the base of the Pro 500 is a recess into which fits the charging prong on the charging stand. It is a sealed unit, which means it can be used in the shower or rinsed under a tap quite happily. The detachable brush head slides on and off the metal prong on the top of the handle. This prong feeds down inside the handle to the motor and battery, which are not user accessible. Nickel Metal Hydride is the battery type used in the brush, which is ok, but not exactly cutting edge and the 20 minute battery life confirms this. The motor inside the handle is too not the most powerful available on an Oral-B brush. It does deliver more movements than any manual brush can, along with a consistent power, but if you are looking for a powerful motor you will need to invest in the likes of the Pro 3000. When the single button on the front of brush handle is pressed, it will launch into the Daily Clean mode. This is the only cleaning mode and it works well with the Precision Clean brush head. It does only use the 2D oscillating and rotating movement of the brush head, compared to the heavily advertised 3D movements that more premium models offer. Nonetheless, compared to a manual brush it can remove up to 100% more plaque. It is not the best cleaning of your teeth you have very had or feel. But, it is easier and likely more efficient than the tried and tested manual brush. A standard brushing cycle is for 2 minutes. During the normal 2 minute cleaning cycle the brush will provide an audible warning via a series of vibrations/pauses after the 2 minutes has ended. This is your built in timer. The brush continues to operate at the end of the cycle, unless you turn it off. Brushing for the full 2 minutes is very important, but just as important if not more so, is the right technique. Make sure you learn how to clean your teeth properly. You do also get built into the Pro 500 a quadpacer. This is another type of timer that integrates with the 2 minute timer. At 30 second intervals you get a brief pause in the brush head motion, which in turn changes the sound. These are an alert to you to change quadrant. There are 4 quadrants in the mouth, upper right, upper left, lower right, lower left. Spend 30 seconds cleaning each of these and you should end up with a fairly even clean of the teeth. You get 10 cleaning sessions of 2 minutes from the Pro 500, but no warning from the brush when the battery is low. There is no battery icon, so it’s up to you to recharge it regularly if you want to avoid it going flat mid clean. When brushing, you should let the bristles of the brush head skim the surface of the teeth, you need not brush hard. If you were to, you may well notice the sound of the brush motor straining and slowing down if you do apply too much pressure. Oral-B has designed their toothbrushes so that most toothbrushes can be used with different heads, meaning they are interchangeable. Each brush head works to achieve different results, with some best suited to particular cleaning modes not available on the 500. The Floss Action brush head also oscillates and rotates like the cross action head does, however in addition to this it has micropulse bristles which help to achieve a deeper clean. The Pro White brush head has a polishing cup in the centre of it which helps buff teeth up to give them the dentist shine. The Precision Clean brush head, the one provided in the box, also oscillates and rotates like the Cross Action and the Floss Action however it has an different cut to the bristles which clean the teeth with a slightly different approach. The Sensitive brush head has softer bristles aligned in a petal formation. They are not angled and are less abrasive on the teeth and gums. Ideal if you have or suffer from increased sensitivity. The Deep Sweep brush head has a sweeping motion which is designed to sweep in-between the teeth to remove more plaque than a manual brush. Remember to replace your brush head at least once every 3 months or 90 days, if not sooner. An Oral-B brush head will actually fade in color as it ages giving you another visual indicator that it is time to replace the brush head. The waterproof handle needs little in the way of maintenance, but to prolong the life of the brush you should make sure that it is given a good wipe every so often to remove and grime and dirt build up and it will continue running well. If for any reason the toothbrush does stop working, there is a standard 24 month guarantee that comes with it. Given the price point, I nor you should expect exceptional battery life from this brush. My hands on testing has found that the Pro 500 will run for 20 minutes. This is equivalent to 10 cleans or 5 days of use, based on 2 cleans a day of 2 minutes. Now, that is not too bad if the charger is close by. Leave it on charge overnight and then you should have another 5 days of brushing power from it. It would be nice if it lasted a week, like many other Oral-B brushes, it would give me more confidence if traveling for a few days with the brush. Sonicare brushes last 2 weeks and some even 3 weeks. The other big issue here is that you get no feedback from the brush in terms of how much power is left. There is no battery or charging icon. It is a bit of a guessing game. If you are the only user you will likely know roughly when it needs charging, well in fact if very low you will feel the speed and power of the motor decrease. But a battery icon with a flashing reminder would be nice. Provided in the box is a charging stand that the brush sits on. The charging dock itself is white in color and has a small prong on the top which aligns with a recess in the bottom of the brush handle and will charge the brush fully in about 16 hours. This stand connects to the mains power and it is perfectly fine to leave the brush sat on here the whole time. With a very reasonable $40 recommended retail price the Pro 500 is certainly at the budget end of the scale. Whilst some retailers, primarily those online are selling it for around $27 there are some asking over the recommended price at $46 – we’ve included a live price comparison here. I can’t quite make out why this is being sold above RRP, because it is not worth it. Let’s assume an average retail price of $30. Factor in the cost of replacement brush heads, which typically works out at around $5 per head. Price it over 3 years (our standard calculation) and the Pro 500 will cost $85 or $0.07 to own per day. This price does exclude the cost of water, toothpaste and electric to charge it and prices do change, but you get a rough idea at how much you will be paying for it over the whole 3 years. This is pretty reasonable, but honestly, although a few Dollars more, there are better options out there in my opinion. If the budget is really tight, don’t get me wrong, this is not bad, it does a few things well. There is too a good chance the brush will last longer than the 3 year period meaning you get even more value from it. When you are investing in a toothbrush you want it to last and on average you can expect most electric toothbrushes to last 3-5 years. From extensive hands on time with the Pro 500 I cannot see any reason why this brush should not serve you well. The weakest point tends to be the battery. After repeated charges and discharges it can fail and should it, they are not easy to replace. Oral-B are a big brand within the industry and have the knowledge and experience to produce quality products. To back you up there is a 2 year warranty included with the brush which will cover you should it fail, providing it is not as a result of user damage. To prolong the life of any brush giving it a rinse and a wipe down to remove grime that builds up is a must. As first electric toothbrushes go, you could do worse. In all honesty though whether this is your first or second electric toothbrush I think for your own benefit, spend a little more and look at the likes of the Oral-B Pro 1000. You get a bit more value for money and most importantly it works towards achieving better oral health care in my opinion. The 500 will give you many benefits over a standard manual toothbrush including a more consistent power delivery. You have the option of different brush heads to suit your needs. A 5 day battery life is ok, but it could be better as could the design. For $15-$20 this is an ok buy, but at it’s current price it is not the best choice. Is the Pro 500 an oscillating brush? Yes, with Oral-B 2D motion that oscillates and rotates. This is the comprehensive everyday cleaning mode that works with the provided Precision Clean brush head to effectively clean the teeth using the Oral-B 2D oscillating and rotating technology to clean the teeth and remove up to 100% more plaque than a manual brush. With the Pro 500, you get one brush Precision Clean brush head with the toothbrush itself. You can change the head with any others on offer from Oral-B. There are many that work with the brush handle. There are 6 main brush head options that include Cross Action, Floss Action, Pro White, Sensitive, Precision Clean and Deep Sweep. Does the Pro 500 have a pressure sensor? Does the Pro 500 have Bluetooth? Does the Pro 500 have sound connectivity? Does the Pro 500 come with a warranty & how long is it? If purchased new from an approved retailer the Pro 500 will come with a 2 year warranty. Does the Pro 500 have a built in timer? Yes. It has a timer which vibrates as the 2 minute daily cycle has been completed. The battery lasts up to 20 minutes, which if used on the standard daily clean mode is 5 days based on 2 cleans per day. Yes, a charging station is included with the Pro 500. The Pro 500 charging station has not been designed to be fixed to a wall. Can I use the Pro 500 in the shower? Yes, the brush handle is completely waterproof. No, there is no travel case included. 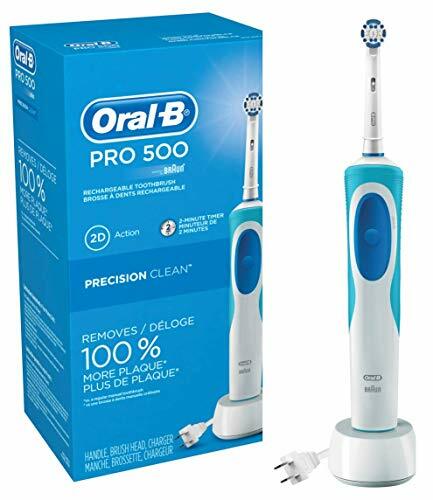 Do you own or have you used the Oral-B Pro 500?